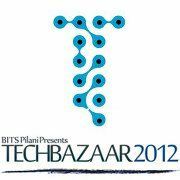 Fest Info: Techbazaar 2012 is the annual technical innovation competition of BITS Pilani. It provides a platform for talented innovators to showcase their ingenuity and use technology to solve the problems of masses which are commercially viable and thus foster the spirit of technology based entrepreneurship.Mentorship and networking are the two key aspects of this event, since a channelized output is much more likely only when enthusiastic and creative young minds are guided by experienced industry veterans. Besides a month long pre-event mentorship for the semifinalists, the top three finalists get to avail a rigorous post-event mentorship under “Innovation Accelerator Program(IAP)”.The event carries a cash-award of INR 1 lakh. Other than securing a funding opportunity of INR 25 lakhs, the best team also has a scope to get incubated at the TBI, BITS Pilani. The finals at Pilani promise the contestants a chance to network with venture capitalists, funding agencies and successful innovators.